Lucas Miles seeks God in church, in movies and in books. Lucas produced the movie “Rodeo Girl” with Kevin Sorbo and is producing a new film, “Crowning Jules,” which is in the works. A 2017 release date is likely as the producer is hunting for a distributor as of September 2016. 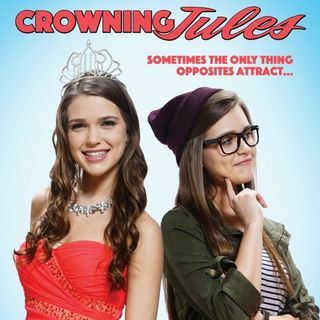 “Crowning Jules” is a teenager adventure comedy along the lines of “Ferris Buelller’s Day Off” meets a non-Christmas version of “Home Alone” meets something from the teen years of the Olsen twins, Miles told me. But ... See More with a family friendly theme. The sisters are played by real life twin sisters Elizabeth and Jacqueline Labadie. “They do finish each other’s sentences” in real life, Miles said. The Labadie sisters just graduated high school recently and have moved to Los Angeles to pursue careers. They have recently appeared on ABC’s “The Middle” sitcom in guest starring roles as college students at the school where the main female lead attends. “We’re crossing our fingers hoping that can become more of a recurring role,” Miles said. “Crowning Jules” also stars Kevin Farley, brother of the late Chris Farley, and, for fanboys everywhere, Kristy Swanson of “Buffy the Vampire Slayer” fame. Swanson plays a “super villain” much like Cruella Deville. Miles, the producer of “Crowning Jules,” said he recently saw a cut of the film and it looks good so far in post-production. He plans to hunt for a distributor in November 2016 at the American Film Market show in Los Angeles. The process of finding a distributor can be complicated, but attending various film festivals is a good way to market a film, he said. Miles is pastor of Oasis Church in Granger, Indiana and the principal and founder of Miles Media, Inc., a film production company. He also is author of the book “Good God,” a title that talks about how a good God is sovereign in the midst of a sin-sick world. My previous story on the book is here. A free study guide is available for "Good God" by contacting Miles' team at info@oasisgranger.com or GodGoodthebook.com. Miles said he became involved in films after dabbling previously in music management for a Christian recording artist. He filmed videos and films as a student. He said he believes that Christians can and should have influence in the film business.